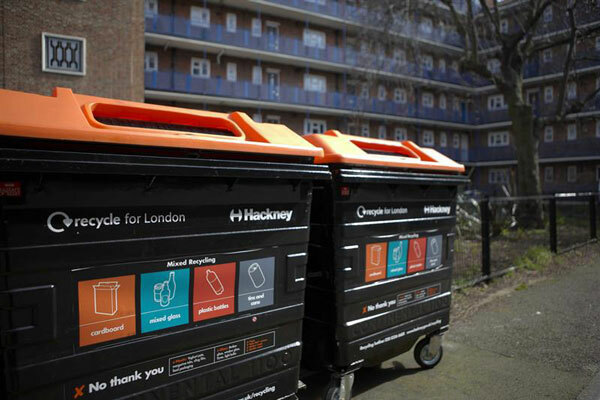 The recycling rate in London’s flats must increase by 40 per cent if the Mayor of London’s target of a recycling rate of 65 per cent by 2030 is to be achieved, according to a report by the London Assembly’s Environment Committee. The report states that for London to improve its ‘laughable’ recycling performance and meet the 65 per cent target set by the Mayor of London in his draft Environment Strategy in August individual households will have to increase their recycling levels by a third, or an extra 57 kilogrammes a year, a figure only currently achieved by six London Boroughs. London’s average recycling rate currently sits at around 33 per cent, despite increased kerbside recycling services, concerted communications campaigns and improvements in waste management technology, and must be increased to 42 per cent for the capital to put itself on course to reach the 2030 target. The report goes on to state that the Joint Waste Disposal Authorities in London informed the Environment Committee that much of the ‘low hanging fruit’ for increasing recycling had already been picked, and that further increases would only be achieved when ‘structural changes are made to collection services’. Most boroughs have already implemented comprehensive household recycling services, such as Camden, which recycles the six main dry recycling streams (glass, cans, paper, card, plastic bottles and mixed plastics), provides weekly separate food waste collections and incentivises residents to recycle more and yet sees its recycling rate remain rooted at 27 per cent. In a bid to improve flagging recycling rates, the Environment Committee has targeted improving recycling services to flats, which make up 50 per cent of the capital’s housing stock. The London Waste and Recycling Board (LWARB) told the Committee that recycling rates in flats will need to be increased by 40 per cent to put London back on track to meet the Mayor’s recycling targets: no easy feat given that analysis by the Waste and Resources Action Programme (WRAP) showed that flat recycling services bring about 50 per cent less recycling than those serving smaller properties at the kerbside. While councils often find it difficult to get residents of flats to recycle due to limited space inside the flats or on the doorstep, areas of greater housing density potentially mean less trips for waste collectors, increasing efficiency and lowering costs. In March this year LWARB created a ‘Flats Taskforce’ with the aim of helping Londoners living in blocks of flats recycle more using bespoke interventions. The organisation, which works with London’s borough councils to promote waste prevention and recycling through a range of programmes, said it would invest £1 million in the taskforce, with work starting this summer. Initiatives designed by the programme will look at improving access to waste services provided to flats across the capital, as well as residents’ awareness of them. The Committee’s report suggests that gains can be made by ensuring that food waste is collected from all flats - less than half of London’s boroughs currently provide this service - as well as providing comprehensive recycling collections to all flats, rather than just ‘where feasible’, as stated in the draft Environment strategy. The report also calls for more to be done to encourage recycling among London residents, including increasing the consistency of collection services across the capital, restricting residual waste collections or providing smaller refuse bins, while the use of fines for residents not recycling properly should be explored across the city. Besides outlining where improvements to the draft Environment Strategy needed to be made, the Environment Committee broadly supports the measures included aimed at increasing recycling, including providing a separate food waste collection service to every household, ensuring that every kerbside household received a collection of the six main dry recycling materials and allowing the Mayor to scrutinise waste contracts to ensure they conform with the Environment strategy. Commenting on the release of the report, Leonie Cooper, Chair of the Environment Committee, said: “The recycling rates in London are laughable when compared to other major European cities, so we must take the issue more seriously. A new year is the perfect time to reflect and try to change old habits. “With a rising population, scarce landfill space and more and more flats being built, time is running out to get a grip on this issue. Londoners need to be able to recycle more. It’s a win/win situation for the environment and for the taxpayer. As the cost of sending waste to landfill increases, it’s the taxpayer who will end up footing the bill if recycling rates don’t improve. The Household Recycling report forms part of a larger investigation into waste management. The committee published a report looking at the circular economy in London in September, and will publish a report on energy from waste in early 2018. The full report by the London Assembly’s Environment Committee is available on the London Assembly website. A circular economy could reduce London’s waste by 60 per cent by 2041 and should be implemented in order to combat falling recycling rates, according to a London Assembly Environment Committee report. LWARB has announced a new business plan that will see the creation of a London ‘Flats Taskforce’ to help residents living in blocks of flats recycle more using bespoke interventions. Recycling in flats will be targeted in a new waste strategy in Barnet after a draft strategy was agreed at a meeting of Barnet Council’s Environment Committee on Monday.